Later today new products will hit my store at Scrap it Sassy, but as usual I'll let you try-before-you-buy with a small sampler of the bundle. I have collected one sample from each pack and hope you'll like it enough to drop by the store to get parts of or the whole bundle. 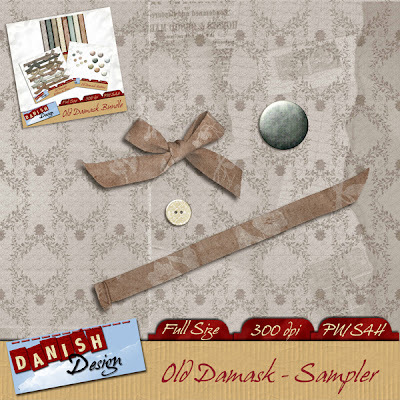 The new bundle is called "Old Damask" and contains a pack with 8 papers/backgrounds ($1.99), a pack with 16 buttons ($1.29) and a pack with 8 ribbons & 8 bows ($1.49). If you choose to buy the bundle containing all 3 packs the price is $2.50 and you will thereby save almost 50% - now that's a bargain! Download the sampler and then drop by my store - you will not regret investing in these new products. thank you so much for the beautiful sampler! Love your new products! Thank you so much for this post. I want to let you know that I posted a link to your blog in CBH Digital Scrapbooking Freebies, under the Page 4 post on Apr. 11, 2012. Thanks again. Thank you so very much for creating this lovely sampler. I especially like the damask paper. Thank you for so generously offering your work to all of us for free. It means more to me than words can say.